Oh, something so darn cute I found at Market -- these little guys are offered as sewing patterns to make stuffed *personalities* and *animals! * You can see that they turn out pretty large in size... I took the pics of them on our Vera Bradley couch. NOT CROSS STITCH at all... I just had to get them anyway. The models look so bright and cheerful in the shop! 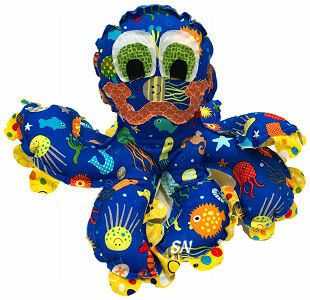 Just for the seamstresses of you out there, we have a few darling patterns of stuffed fabric animals. 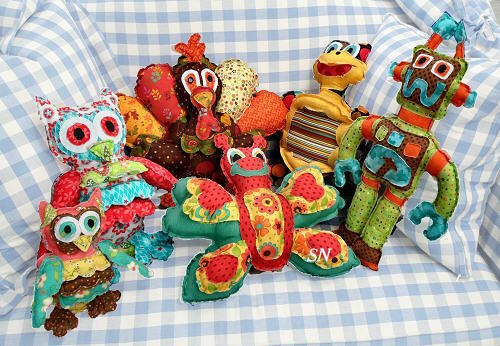 For the little ones in your life, they are sewn of bright fabrics (your choices) and bring smiles to their hearts! What makes them cute is the fact that the seams are NOT turned in -- they are sticking out -- so they kind of have a more 3-dimensional attitude to them. Finn is about 15 inches long, 6 inches fat and 11 inches long. Ash is at least 15 inches... and he has 8 legs. These are not Cross Stitch patterns -- they are sewing patterns -- and match the rest of our Freddie's Friends Stuffed Zoo! We have a line of stuffed 'people' in the shop -- I found the fabric patterns at Quilt Market one year -- and we keep selling them! 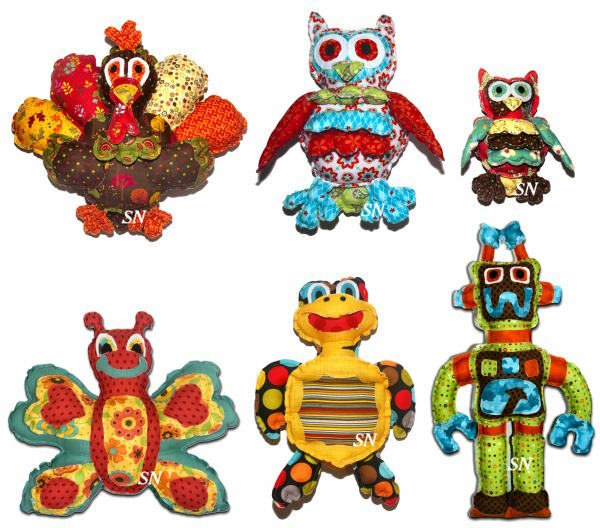 Absolutely darling... they are regular sewing patterns to make these 12-ish inch turkeys, robots, penguins and turtles. Choose bright fabrics... what makes these so attractive to the seamstress is that there are no turned seams in them. They are pieced together (wrong sides together) with no turning inside out! No Cross Stitch involved... we have our shop models perched together... and they keep drawing comments!!! New are Penny Penguin, Eliza Chickie, Becky's Flower and Issac's Star patterns. Gabby the Gobbler, a turkey, finishes approx 18 x 19 x 4. 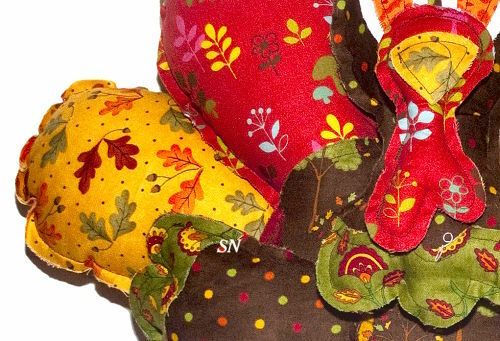 Olive the Owl comes in a mama and baby size -- 7 x 3 x 11 and 11 x 5 x 16. Bonnie the Butterfly is 18 x 4 x 15. 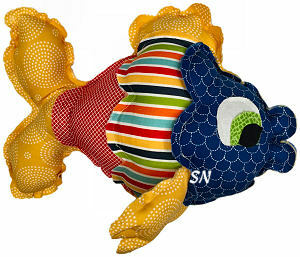 Scotty the Sea Turtle is 18 x 4 x 13.
and finally Ronny the Robot is a whopping 22 x 3 x 16!